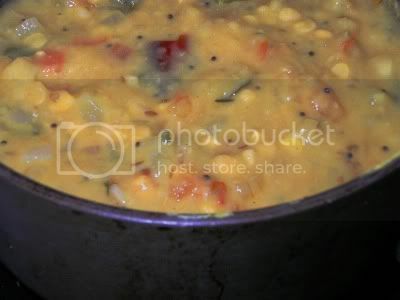 This preparation falls somewhere between kootu and dal - it isnt a kootu because it doesnt have ground coconut masala to flavour it and it isnt quite a dal because I added sambar powder as flavouring. Whatever, it tastes just great with chapatis and is just as nice with rice. I guess there are plenty of cooks out there who have various ingenious ways too make this vegetable, but for someone like me, who has only tried it the "kootu" way, this recipe was quite radical. Especially as it was more or less off-the-cuff! 2. In a pan, heat the oil. Add the mustard seeds, cover and let them pop. Then put in the cumin seeds, green chilli paste, red chillies and curry leaves and fry for about 30 seconds. 3. Add the onions now, stir well and cook till they turn soft. Then add the tomatoes and 1/2 cup water and cover, cooking till the sauce is thick and the tomatoes mushy. 4. Now stir in the coriander powder and sambar powder and then add the cooked vegetable and dals. Add salt to taste. 5. Bring to a boil, then turn the heat down to a simmer and let it cook for 5 minutes. Garnish with chopped coriander leaves and serve hot with chapaties or over steamed rice. 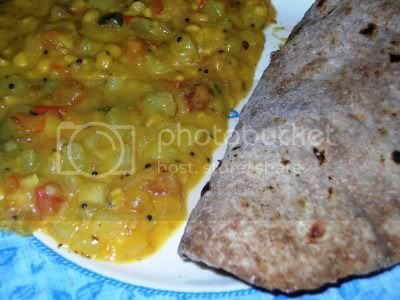 Shammi,I prepare a very similar,infact,almost the same recipe with bottle gourd and fresh grated coconut as garnish.Tastes great with both rotis and rice. wow, have never tried this way of chow chow. shall try it soon. Looks simple and tasty too. Hi Shammi - Could you "translate" the two dals, please? I've had two great or three great experiences with chayote in the last few months and would love to try yours, too. Tried this recipe out last night. It came out really good. Thx! I am wondering if this recipe could be tried with white pumpkin or Poosanikai. Luckily, came across yr site and it is really amazing. Though, all the dishes are seems to be very familiar, but some twist to make the taste differ from the usual ones!!! Kudos to you and yr site..Pls do keep posting more recipes. BTW, recently tried vazhakkai kootu, peanut laddu, carrot rice, palak paneer sabji & kara sambar and everything came out incredible. Not even a single fault.. It's so nice to be included!